A superyacht is a luxury yacht (sometimes called mega-yachts or giga-yachts) that range in size from 24m to 180m in length. 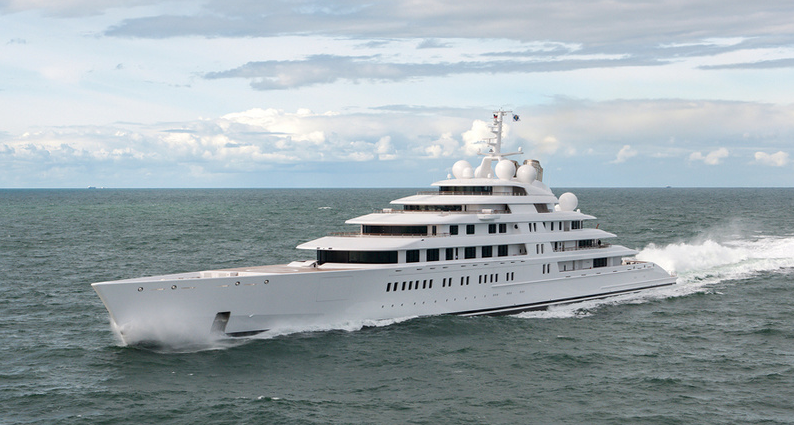 Azzam is currently the worlds largest superyacht measuring 180.5m and worth $400 million! Think of these privately owned yachts as a 7* floating hotel which will either be used exclusively by their owners or run as a charter business and will be seen in the best destinations around the world. Superyachts will typically spend the Summer months cruising the Mediterranean visiting destinations in Spain, Mallorca, the South of France, Monaco and Italy, taking in Grand Prix and film festivals. At the end of the summer season, they will cross the Atlantic to spend the winter months in the Caribbean. However, there are now many yachts breaking this mould and cruising around the likes of the UAE, Maldives, Bali and Thailand. There are even explorer yachts that are purpose-built for long distance cruising to remote parts of the world. In 2017 there were 127 new superyachts delivered to their owners, with the largest measuring 143m. With 455 new yachts on order at various stages of design and build. Did you know a new yacht can take 4 – 5 years to build from contract to launch! So who works onboard superyachts? This industry has a real focus on luxury, a prestigious sector where standards and expectations are high. With this in mind, there is a demand for professionally trained crew to uphold these expectations. The number of crew these boats need can range from 8 – 80 and will be responsible for looking after every element of the superyacht. A typical working week will depend on the owners, how the boat is chartered and on what hours the Captain sets when there are no guests onboard. Job roles in the Deck , Engineering, Interior and Galley departments as well as shoreside support employ approximately 163,000 people worldwide for 4,950 superyachts. Crew members live on board and are paid a generous MONTHLY salary in return for hard work and high levels of service. Most of your living expenses are also covered by the owner, you would not expect to have to pay rent, food, electricity or water bills for example. Your earnings, which are typically paid in Euros, are also tax-free! 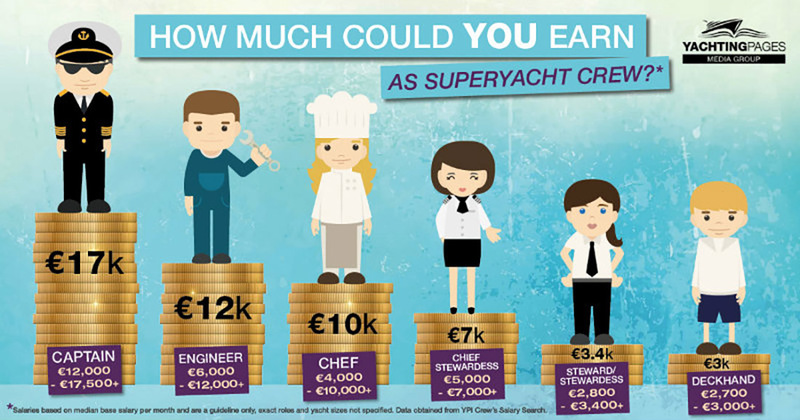 Below is a good example of wages by position onboard which was compiled following a 2016 salary survey conducted by Yachting Pages. What training do I need to work on a superyacht? The legal minimum qualification required for crew onboard boats of 24m+ is STCW Basic Safety Training. With this qualification you could realistically seek employment as an entry-level Deckhand or Steward/ess, however with the exacting levels of service required more and more boats and recruitment agents are looking for candidates with a higher level of qualification (Yachtmaster) or particular skill sets (carpentry, child care, masseuse, beauty therapist etc). You will also need the right attitude and a good work ethic. We are a 67.5m Motor Yacht and we hire only Yachtmasters on deck. As our Safe Manning requires at least two Deck crew members to have Yacht rating which is covered by having a Yachtmaster certificate otherwise a candidate with an STCW must perform 6 months sea service and apply for a Yacht Rating Certificate. We have a deck crew of 4 so we only require two Yacht Ratings/Yachtmasters but we hire 4 Yacht Ratings/Yachtmasters to cover ourselves if we have a member of the team absent. Most yachts in the category of 50m to at least 70/80m will operate in a similar way. Larger or smaller yachts may be more inclined to hire deck crew with only an STCW. This isn’t the only reason we hire Yachtmasters. We hire them because we believe after a crew member has invested the time and money into a Yachtmaster course they are more serious about making a career in the industry. Also from experience, a Yachtmaster is far better on deck as they have a good base knowledge of line handling, weather, boat handling etc than someone with just an STCW. For the reasons above I personally believe Yachtmaster is an entry-level ticket to our industry now. What yachting career courses does UKSA provide? Or contact our knowledgeable course advisors on +44(0)1983 203038 or [email protected]. 5 reasons to start your superyacht career with UKSA? Over 30 years of training excellence delivering courses developed in response to industry needs.